Chocolate Cake with Walnuts and Prunes - Let the Baking Begin! This is the cake we made for celebrations when I was a kid. I remember my aunt, who at the time was the baker in the family, mixing the batter and me trying to sneak my little finger into the bowl and trying to get a taste of the batter, or waiting impatiently to lick the bowl. Chocolate batter always tasted the best! Who else liked to lick the bowl? 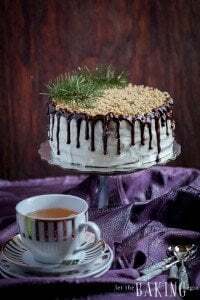 This is a very soft, moist and delicious cake made with chocolate sponge cake, prunes, walnuts and sour cream frosting. Back in Ukraine, where I am from, sour cream was just cultured heavy cream. It would whip up just like heavy cream, but here, they do something to the sour cream that it does not whip up, so to compensate I combined the sour cream (for taste) and heavy cream (for fluffiness) in ratio of 1:1. If you don’t mind unnatural ingredients, you can even add some Cool Whip, but I do try to stay away from that stuff, so you can use it at your own discretion. I like my cakes with lots of frosting and make sure that there is always enough for some kind of decorations, so this makes enough for the ‘flowers’ on top of the cake, or any other decoration that you might come up with. With the amount of ingredients listed in the recipe, you will be able to make one 8 inch cake about 4 inches tall. If your pan is bigger than 8 inches, I would increase the recipe by 1/2 for 9 inch round pan, or by 2 for a 10-inch pan. A couple of posts earlier, I talked about regular sponge cake, well this cake uses a chocolate sponge cake which basically is the same recipe, except for you add some cocoa powder. Also, if you don’t have chocolate cookies to crush up in the blender for the side decorations, bake an extra cake layer, tear it to small pieces and dry in the oven at 200F, until crumbly. Process in the food processor until fine crumbs form. Black Forest Cake – Moist chocolate buttermilk cake layers with sweetened whipped cream and cherries. 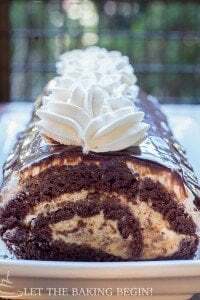 Marble Cake – Chocolate & vanilla cake with cherries and a sour cream frosting. 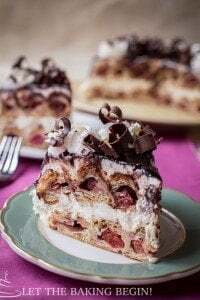 Chocolate Cake – Chocolate Walnut Cake layers frosted with Sour Cream Frosting and Dry Plums. In a small sauce pan, bring sugar, water and vanilla extract to boil, mix until all sugar dissolves. Turn off heat. Let cool. Line two 8 inch baking pans with foil or parchment paper. Spray with non stick spray. Set aside. Pour warm water over prunes to soften them. Set aside. Finely chop the walnuts. Set aside. Melt butter in the microwave. Set aside. In a bowl of a mixer fitted with the whisk attachment whip the eggs on high for 1 minute. With the mixer still running slowly add the sugar and continue whipping for 5-6 minutes, until pale yellow and fluffy. Meanwhile combine the flour, cocoa and baking powder and get fine sieve ready. Combine melted butter and hot water with a whisk. Once the eggs are whipped up, sift the flour mixture into the eggs and carefully fold them in with a spatula, in 2 additions. Once there is no streaks of flour, add the melted butter mixture and fold it in again, until thoroughly incorporated. Divide between two prepared pans. Put wet cake strips around pans (if available), to keep cakes leveled. Bake for about 15 minutes, or until a toothpick/skewer inserted in the middle comes out clean. Do not over-bake or the cake will be dry. Let rest in the pan for 2-3 minutes, then carefully invert onto a cooling rack and let cool. Remove the prunes from the water and thoroughly dry with a paper towel. Chop into small pieces. Combine chilled sour cream and chilled heavy cream in a bowl of a mixer fitted with a whisk attachment. Start whipping, going from slower speeds and increasing the speed as the cream thickens. Once the cream has some volume, add the powdered sugar in 3 additions and the vanilla extract. Continue whipping until stiff peaks. Refrigerate until ready to use (try to use within 30 minutes of making). 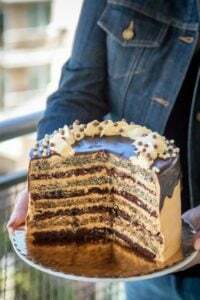 Split each cake layer horizontally into 2 even layers, making 4 cake layers total. When layering always put the cut side up, except for the last cake layer, that one must be the bottom side up (to make for an even surface of the top). Place a dab of frosting on your serving plate. Put 1 of 4 cake layers on the plate, put 4 2-3 inch strips of foil of parchment paper right under the cake, to cover the serving plate and to make for easy clean up after the cake has been decorated. Brush the cake with some simple syrup. Put 1 cup of frosting, even it out with a spatula. Sprinkle 1/3 of the chopped prunes and 1/3 of the chopped walnuts. Cover with second layer of cake, press down to make it flat and repeat with syrup, frosting, prunes and walnuts. Do the same with the next cake layer. Finish with 4th cake layer bottom side up. Cover the whole cake in frosting. Place the leftover frosting in a pastry bag fitted with a star tip and pipe out stars on top of the cake, starting from the edge and working towards the middle. Put 1 dry blueberry in the middle of each piped star, to make a center of the ‘flower’. Finish the cake with the chocolate cookie crumbs on the sides of the cake. To do this, take a handful of crumbs in the palm of your hand, keeping it open but ‘cupped’, gently press against the sides of the cake, letting excess fall off. Keep going around the cake until the cake is covered in crumbs. Remove the cake strips from under the cake, exposing clean platter. Cover the cake and refrigerate overnight. Serve chilled with coffee or tea. Hi…A mozhno sdelat picture kak ti delaesh cake??? How did you get your cakes baked in 15 min? I baked it twice now and it took 25 min. Delicious cake!! I love it. I take away 3 tbsp of flour and add more cocoa, for a total of 8 tbsp of cocoa for a rich chocolate flavor. Delicious! Great cake and is one of my favorites. 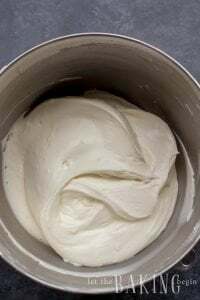 If you purchase organic sour cream and beat it for 10 minutes when it starts foaming and add sugar slowly and beat it another 5-10 mins it will reach the consistency that you are looking for. It will be foamy and will hold shape. I assume that the flour is AP here not cake flour, right? Tried making the frosting 3 times and it still was watery not thick. Please help! The only thing I can think of is that you might be using the wrong cream. It needs to be at least 33% fat content and its usually labeled as heavy whipping cream. If the problem persists, try whipping the cream and sugar and in the end fold in the sour cream. Hope this helps! Обожаю чернослив! Но! I never tried a prune cake! My friend from Mexico tried one when visiting her homeland and actually stole a recipe for me, but lost it while traveling… Pinning to my todo list! If you like chernosliv, you will love this cake! Hello there,I made this cake yesterday (Valentine’s Day) and it was so tasty! My hnausbd was all praising and I was all smug, lol. But I did cheat with the sauce; I used 1/2 cup cream and 1/2 of fat free milk. I used 1/2 cup of muscovado sugar and 1/2 cup of light brown sugar. As for the butter, I think I used probably 1-2 tablespoon. Then I simmer until the sauce thickened slightly. And we ate the cake with frozen yogurt. Thank you so very much for this yummy recipe. I’m a little confused at how much to increase the ingredients for my 10″ round pan. Help please! Thank you! For a 10 inch cake, you can go ahead and double the recipe (it will be a tall cake). Marina,you are amazing! I absolutely enjoy your blog,all the recipes and i love your photos..they make me want to make what you post! 🙂 cant wait to this scrumptious looking cake..thank you for sharing! Thank you Tanya so much! really appreciate your lovely comment! Once you do try it, let me know how you liked it! I love this cake! You’re such a master-decorator: love the stars on top of the cake! Do you bake highly decorated cakes like that a lot? I just have to pin this cake to my board. Yeah it’s got to be one of my favorites! I can’t wait to try this cake out tomorrow… I did discover a bit of a bug. When I go to the “print recipe” tab, it opens up a blank page. Tanya, did you try opening it in a different browser? I just tried opening it on my iPad with safari browser and it opens up with a recipe like it is supposed to.